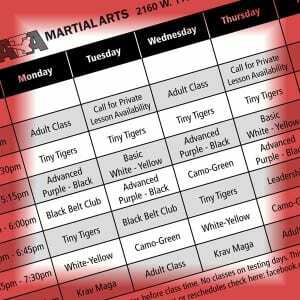 Duer’s ATA Martial Arts has been growing over the last year. Thank you so much for helping us become one of the top rated Martial Arts Schools in Lane County. Your continued support of our small business is greatly appreciated. With the staff changes that have occurred, it is important that we continue to make sure the needs of our students are being met on and off the floor so they are prepared and confident for testing and tournaments. After several meetings with our Instructors and much consideration, we have decided to change the schedule to better serve the students’ and parents’ needs. We understand that sometimes it is difficult to make classes on time due to school obligations and or traffic issues; therefore we are pushing classes up 15 minutes later. We are also breaking up the white thru green belt classes to a white, orange, and yellow combination class and then a camo to green grouping. Plus, there will be a beginning sparring class for those who still need to work on the basics, regardless of age. The advanced sparring class is now available for those who are more comfortable and experienced with the sparring. With this new class restructuring there will be no Saturday classes. Since we will be adding curriculum classes on Friday, there is no need to continue Saturday class. This also assures proper time off for our Instructors. I hope you are all as excited as we are to start this new schedule. Again, if you have any questions or concerns please set a time to meet with Master Duer.